Momentum Pictures have released a handful of new images from "ABATTOIR", which is set to release in theaters, VOD and Digital HD on December 9, 2016. Written by Christopher Monfette ("12 MONKEYS") and directed by Darren Lynn Bousman ("SAW II", "SAW III", "SAW IV", "11-11-11", "REPO! ", "MOTHER'S DAY"), the film stars Jessica Lowndes ("AUTOPSY", "THE HAUNTING OF MOLLY HARTLEY"), Joe Anderson ("CREEP", "THE RUINS", "THE CRAZIES", "HERCULES"), Lin Shaye ("INSIDIOUS") and Dayton Callie ("HALLOWEEN 2", "THE DEVIL'S CARNIVAL"). 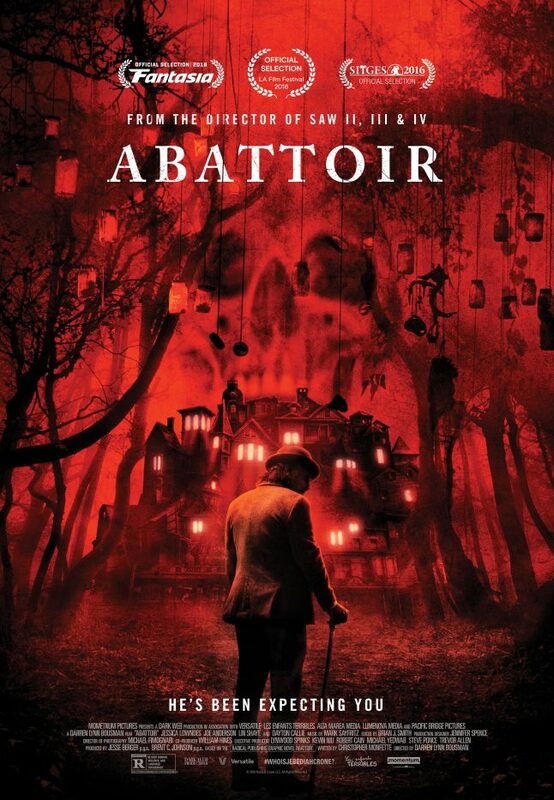 "ABATTOIR" is the opening night film of the 14th annual New York City Horror Film Festival, which will be held Nov 10-13 at Manhattan's Cinepolis Cinemas (8th Avenue & West 23rd Street). Synopsis : Abattoir centers on a real estate reporter (Jessica Lowndes) who unearths an urban legend about a house being built from rooms where horrific tragedies have occurred. The investigation ultimately leads her and ex-lover Detective Declan Grady (Joe Anderson) to the enigmatic Jebediah Crone (Dayton Callie) and the answer to the question, "How do you build a haunted house?"